Between August 21 and September 9, 2018, American prisoners were called to strike by several of their organizations. It is not the first time that such a mobilization takes place. A socio-historical approach allows to put it into perspective, and illustrates the contradictions between the prison system and collective action. This text was first published on September 4 in La Vie des Idées and intended for a French audience. From August 21 to September 9, 2018, prisoners in the United States were called to participate in a nationwide strike through work stoppage, sit-ins and a hunger strike. The choice of these two dates is significant: August 21 commemorates the 1971 murder of prisoner George Jackson, an important figure in the Black Panther Party, and September 9 refers to another important event in 1971 that marks the history of the prisoners’ and African-American movements: the mutiny and State massacre at Attica prison. In the early 1970s, political mobilizations, particularly those of the Black liberation movement, roused prisoners, especially in Attica, where blacks and Latinos made up the vast majority of the prisoners, despite their geographical isolation (Attica is more than 340 miles from New York). On September 9, more than a thousand prisoners took partial control of the prison and about 40 guards and employees were held hostage. On September 13, following the order of Nelson Rockefeller, the governor of the State of New York, the police launched an assault. This resulted in 43 deaths (ten guards and thirty-two prisoners) and many wounded. During the long judicial history that followed, most of the charges against prisoners were finally dropped and the sentences commuted. In the early 2000s, the State agreed to compensate the victims (prisoners and hostages) and their families, but never admitted responsibility. In her 2016 book Blood in the Water, historian Heather Ann Thompson finally revealed some circumstances of the drama that had been hidden by the authorities for a long time. The State massacre has had a lasting impact on the prisoners and Black liberation movements in the United States. It has also had a strong impact in France, especially among the Groupe d’Information Prison (Information Group about Prison) activists, as evoked by the book directed by Philippe Artières (2017) in which many archives of the event are reproduced. Just over 1% of prisoners participated in the previous strike, launched on September 9, 2016. The figure may seem low. Yet, with more than 24,000 participants, it was the largest prisoner movement in US history. The 2018 strike will no doubt be of at least equal magnitude. Although just a part of a broader dynamic of prisoners’ mobilization, the strike is not only notable for its scale, but also for its demands: these demands relate to the conditions and the nature of the prison labor and radically call into question the current organization of the prison system. The strike also reveals the growing use of the unionization strategy in contemporary US prisoners’ movements. In fact, this strike and the previous one have been initiated by prisoners’ organizations (the Free Alabama Movement in 2016, the Jailhouse Lawyers Speak this year) and they are supported and coordinated by a prisoner union, the Incarcerated Workers Organizing Committee (IWOC), a section of the revolutionary union the International Workers of the World (IWW) created in 2014. This strike echoes the rich international history of the unionization strategy by prisoners’ movements. The use of this strategy, in the United States as well as in Europe, was particularly noticeable in the context of the prison revolts of the 1970s and 1980s (see, for example, Huff, 1975). Yet, by the beginning of the 20th century, the IWW had already unionized incarcerated workers. In fact, the IWW stands out from the rest of the labor movement, which often excluded incarcerated workers based on the Marxist analysis indicating the “lumpenproletariat” as a counterrevolutionary force. Nevertheless, struggles around prison labor, and the use of self-organization is not unusual in the history of prisoner movements. A socio-historical and comparative approach suggests questioning the current re-emergence of the unionization strategy in the light of the political, legal and institutional issues that have shaped its history. It also suggests examining the difficulties and dilemmas faced by these organizations, as well as their relationships with the prison institution and the rest of the prisoner movements. Are Prisoners’ Unions a Novelty? In November 1970, after a 19-day strike, prisoners in Folsom, California, created the Prisoners Union (PU), one of the first prisoners’ unions in the United States (Irwin, 1980). A few months later (during the summer preceding the mutiny and the State massacre), prisoners from the Attica Liberation Front demanded the right to form or join a union. Founded in 1973, the North Carolina Prisoners’ Labor Union (NCPLU) has grown rapidly. It is probably the most well-known prisoners’ union, particularly because its name is associated with a famous Supreme Court decision (see below). A year after its founding, it already had 2,000 members in 40 prisons. During the 1970s, several dozens of prisoners’ unions were created across the United States and the prisoners’ movement relied largely on the unionization strategy, as shown in many prisoners’ newspapers. In Europe, numerous prisoners’ unions also emerged in the 1970s: the Preservation of the Rights of Prisoners in the United Kingdom (Fitzgerald, 1977, 136-197), the Prisoners Union in Northern Ireland (Behan, 2017), the United Prisoners’ Central Organization in Sweden, the Prisoners’ Trade Union in Norway and the Prisoners’ Labor Union in Denmark . In France, the right of association of prisoners was mentioned in the political platform of the Comité d’Action des Prisonniers or CAP (Prisoners Action Committee) and was discussed in 1973 in its newspaper a year after its foundation. However, the unionization of prisoners did not attract much interest in prisoners’ movements in France and the very first prisoners’ union in the country was created a decade after those in most other Western countries: the Association Syndicale des Prisonniers de France (ASPF)  was founded in 1985 by prisoners in the jail of Fleury-Mérogis (a Paris suburb). It was headed by an “inside president,” himself detained, Jacques Gambier, and an “outside president,” Jacques Lesage de La Haye, with the support of the Fédération Anarchiste (Anarchist Federation). Its membership has peaked at more than 300. Prisoners’ unions in the 1970s emerged in the wake of powerful prisoner movements, as revealed by the many mutinies. These movements emerged in a tumultuous political context, including the rise of Black liberation movements, including the Black Panther Party (Diamond, 2016). Meanwhile, the radical Left experienced repression that forced them to take a position on the prison system. However, the political positions of prisoners’ unions were diverse: some were fundamentally reformist and strived to distance themselves from the use of violence in prisoners’ movements, others were revolutionary and advocated for the abolition of prison (for example the ASPF). Nevertheless, the use of unionization is strongly aligned with various political practices and forms of self-organization. In respect to self-organization, the Walpole (Massachusetts) prisoners’ section of the National Prisoners Reform Association was put to the test in 1973 when it managed the prison for several months (see Bissionette, 2008). Prisoners’ unions created in the 1970s all faced repression, either formally (censorship of correspondence, etc.) or informally (disciplinary transfers of prisoners from one institution to another, etc.). Because of repression, many prisoners’ unions adopted a two-headed structure, with an “outside” head that was able to replace the “inside” head (of prisoners) when the latter was impeached. In addition, prisoners’ unions faced legal uncertainty surrounding their status: the right to associate and to unionize for prisoners is not recognized in the United States nor in France. This situation leads them, quite naturally, to engage in legal battles. For example, in France, the ASPF’s struggles focused on prison labor and the conditions of detention, but it devoted most of its activities on obtaining the right for prisoners to associate. The movement is indebted to the CAP for its strategic analysis of this issue, as the existence of a prisoners’ organization was conceived of as a condition for securing the gains of the prisoners’ struggles and for escaping the “mutiny-repression” cycle. The ASPF was therefore conceived as a tool for prisoners to obtain the right of association. The Commission d’Étude sur le Droit Fondamental d’Association (Study Commission on the Fundamental Right of Association), formed in support of the ASPF and chaired by former judge Étienne Bloch, was dedicated to this issue. The ASPF’s ability to engage in legal battles, however, faced major hurdles, and it was a full ten years after its creation, that prisoners were actually authorized to file a complaint against administrative decisions affecting them, and and that militant uses of the law developped (Lochak, 2016). The situation of prisoners’ unions is quite different in the United States, since their development coincides with the success of this type of lawsuit in the courts. This era was inaugurated with the Procunier v. Martinez Supreme Court decision in 1974, which overruled the previous doctrine known as “hands off”—the non-interference of the Courts in prison issues. Many prisoners’ unions then seized the opportunity to file complaints, including against the censorship of correspondence. However, in 1977, in Jones v. North Carolina Prisoners’ Labor Union, the Supreme Court decision excluded the right to create or form a union from the protection prisoners enjoy under the First Amendment of the Constitution. This decision put a stop to prisoners’ unions’ legal battles. Many prisoners’ unions, in the United States and elsewhere, have never moved beyond the organizational stage and few have gone beyond a few years of existence—the Australian organization Justice Action being, in this regard, an exception. The short existence of most prisoners’ unions can be explained by the intensity of the legal and political controversies that have marked their history. In the United States, many of them, including the NCPLU, are either running out of steam or disappearing quickly after the failure of their legal battle (see Tibbs, 2012) to which they allocated a significant portion of their human, material and financial resources. The other unions rarely escape the political controversies surrounding the unionization strategy that often arise in the prisoners’ movements from which they originate. This kind of controversy, combined with the burden of administrative censorship, is what put an end to the ASPF in less than two years. Similar issues generated the split of the Californian PU in 1973 that resulted in two organizations, one reformist, the Prisoners’ Union, and the other radical, the United Prisoners Union, associated with the California radical movements (Cummins, 1994). Justice Action (JA) was founded in 1973 (as the Prisoners’ Action Group) in the context of important prisoner revolts (particularly at the Bathurst Correctional Complex) and of growing support from outside organizations to prisoners’ rights and struggles. JA conducts political and media campaigns (especially on prisoners’ voting rights) and contributes to the dissemination of abolitionist thought. It helps incarcerated people both psychologically and legally. JA claims to represent people locked up in Australian prisons and hospitals. It founded the Prisoners Union Liaison in 1979 and the Australian Prisoners Union in 1999. Still active today, the latter organization, which acts from the outside, plays the role of a prisoners’ union. JA’s current coordinator is Brett Collins, a former prisoner, but also one of its co-founders. Union Strategy: At the Risk of Participation? Prisoners’ unions echo in many ways the “improbable mobilizations” of marginalized social groups (see, for example, Mathieu, 1999). The similarities that lead us to describe them as “improbable organizations” result from a socially stigmatized collective identity, in this case that of “prisoners.” Prisoners’ unions’ analysis of the prison system often results in their distancing from the stigma associated with the status of prisoners. For example, in the United States, they may use the expressions “convict class” and “convict race” which suggest that prisoners are from one social class and have shared interests beyond race in particular. In France, the internal debates of the CAP and the politics of the ASPF pushed for including the prisoners’ struggles within the wider framework of workerism. However, this position has been widely criticized by the rest of the prisoners’ movements and by prison abolitionist organizations and it has not materialized in any kind of alliance with labor unions. The choice of unionization as a strategy often leads organizations to distance themselves from the rest of the prisoners’ movements because of the quest for legitimacy (in and out of the prison field) inherent in this strategy. This dynamic has accelerated the disappearance of the ASPF, and it has also contributed to the lasting decline of the unionization strategy in prisoners’ struggles in France (see Soulié, 1995). More broadly, in the United States as in Northern Europe, prisoners’ unions hardly escape the dilemma of “respectability” versus “radicalism”. Indeed, unions have to renounce the idea of a conflict of interest between prisoners and the prison administration (Mathiesen, 2015) in order to be recognized by the latter as a legitimate interlocutor. The bilateral negotiations with the prison administration thus tend to lessen the radicalism of their position and their capacity to mobilize the prisoners, but also to build alliances with external organizations. This dynamic, alienating prisoners’ unions from their base (the prisoners), has raised the attention of prison administrations. In France (see Charbit, 2018) as in the United States (see Tibbs, 2012), the scale and intensity of prisoners’ mobilizations have led prison administrations to implement regular institutional dialogues between themselves and prisoners’ representatives (either selected or elected), including in the form of inmate committees (see Bishop, 2016). These reformist programs have been used strategically to slow down or thwart the development of prisoners’ organizations, particularly prisoners’ unions, by offering them an official alternative (see, for example, Goldsmith Kasinsky, 1977). The cases of ASPF and NCPLU are exemplary: the first was partly thwarted by the generalization of socio-cultural associations in the 1980s and the second by the establishment of an Inmate Grievance Council designed by David L. Jones, the secretary of the North Carolina Department of Corrections, who explicitly wanted to sabotage the unionization of prisoners (Tibbs, 2012). 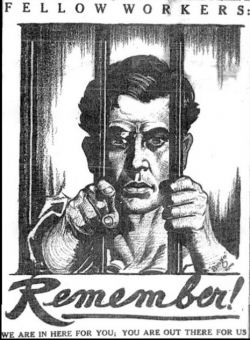 The slogan of the Folsom prisoners illustrates a strategic analysis regularly deployed by the prisoners’ movement in the United States: to be effective, the mobilization must attack the economic interests of the prison system. This analysis is in line with the concept of the “prison–industrial complex” (PIC) promoted by Angela Davis (2003) and Critical Resistance, the largest penal abolitionist organization in the United States. The PIC appellation refers to the “military–industrial complex” which underlined the powerful links between the defense industry and the military and political powers. The analysis of the prison–industrial complex indicates that it developed in the post-cold-war context and that it is goes with the development of the “non–profit industrial complex” (Incite! Women of Color Against Violence, 2007). The “prison–industrial complex” includes prison labor and the large workforce (estimated at about 900,000 people) that is made available to prison administrations themselves, private companies, but also public authorities (for example, the State of California in the fight against fires). In addition to the extremely low wages that prisoners are paid (usually less than a dollar a day), they often work in degrading conditions—impossible to compare to French prison labor, yet scandalous in many ways, as underlined by an editorial recently published by academics. In France, criticism of prison labor focuses on working conditions, remuneration and exceptions to labor law (see Guilbaud, 2012). In the United States, this criticism goes hand in hand with the recognition of the historical continuity of prison with slavery. This thesis, developed in the academic field notably by Angela Davis (2003, 22-39), Douglass A. Blackmon (2008) and Ruth Wilson Gilmore (2007), emphasizes in particular that prison labor is an exception to the prohibition of slavery contained in the 13th Amendment of the Constitution. The 13th Amendment to the United States Constitution, adopted in 1865 at the end of the American Civil War, abolished slavery and voluntary servitude, except “as a punishment for a crime for which the author was duly condemned.” Beginning in 1876, southern states enacted laws known as “Jim Crow Laws” that allowed for racial segregation in public places and services. They were only completely abolished in 1964. In fact, between the 1860s and 1950s, the southern states of the United States used chain gangs (or forced labor) carried out by mostly African-American prisoners. Chain gangs have been used in particular for the construction of public equipment such as roads and bridges, but the prisoners’ labor force has also been rented to private companies (see Blackmon, 2008). The analysis of contemporary prison labor in terms of “slavery” is also based on the overrepresentation of ethnic minorities, especially of African-Americans, who are incarcerated in US prisons. Moreover, Michelle Alexander (2010) argues that “mass incarceration is, metaphorically, the New Jim Crow”. However, such analyses tend to raise controversy:  they are widely criticized by those who disagree with their promotion of race over class considerations and who analyze mass incarceration within a wider movement, originating in the 1970s, that promotes the culture of punishment. Because of its economic and political stakes, prison labor in the United States today is a radical lever for the prisoners’ movement, but also more broadly for the abolitionist movement, in the context of a lack of recognition for prisoners’ right to organize (Fink, 2016). While the unionization strategy has rescinded in the prisoners’ movement since the late 1980s, the current organization of the US movements around prisoners’ unions and organizations is not unique. In recent years, the creation of prisoners’ unions has been reported in Canada, Germany or the United Kingdom (the Association of Prisoners). Some prisoners’ unions are now formally established, such as the Gefangenengewerkschaft / Bundesweite Organization (GG / BO), created in May 2014 in Germany, the Bulgarian Prisoners’ Rehabilitation Association (BPRA), established in 2016 in Bulgaria, an IWOC section created in the United Kingdom in 2016 and the Syndicat pour la protection et le respect des prisonniers (Union for the Protection and Respect of Prisoners), created in France in early 2018 in response to the movement of prison guards. In Argentina, the Sindicato Único de Trabajadores Privados of the Libertad Ambulatoria, founded in 2012, has managed to be recognized by the prison authorities and to be affiliated to an “outside” union—a real triumph considering the difficulties encountered by the prisoners’ unions in the 1970s. The socio-historical analysis of prisoners’ unions shows that they have often suffered from the political and legal controversies they have raised, and from their own tactical dilemmas. This compels us to take a critical look at the promotion of prisoners’ representation and collective bargaining in prison management. For example, such policy is promoted by the 2006 European Prison Rules and by the 2009 Loi Pénitentiaire (Penitentiary Act) in France, and the French prison administration is clearly interested in the “collective right of expression of incarcerated individuals” (as in the title of the report by Cécile Brunet-Ludet, 2009). Analyzing the emergence and development of prisoners’ unions in the United States is particularly interesting because this country is renowned for its poor tradition of trade unionism and the contemporary political context is not considered favorable to trade unions. This strike, potentially the most important confronted by the US prison system, attacks the heart of the prison system through its focus on prison labor. Additionally, it reinvigorates the prisoners’ union strategy and generates interest in the way it relates (or not) to penal abolitionist politics (Kilgore, 2013). The history of prisoners’ unions shows that their main weakness is often the lack of outside support. However, the current prisoners’ strike in the United States does not suffer from this weakness: many organizations support the movement and a wide campaign (boycotts, sit-in, phone zaps or call-in campaigns, etc.) is being carried out outside of the prisons. •	Philippes Artières, ed., Attica USA 1971, Cherbourg, Le Point du Jour – Centre d’Art éditeur, 2017. •	Michelle Alexander, The New Jim Crow: Mass Incarceration in the Age of Colorblindness, New York, The New Press, 2010. •	Norman Bishop, “La participation des personnes détenues à l’organisation de la vie en detention”, Champ Pénal/Penal Field, 3, 2006, online. •	Jamie Bissionette (with Ralph Hamm, Robert Dellelo and Edward Rodman), The Prisoners Ran Walpole: A True Story In The Movement For Prison Abolition, New York, South End Press, 2008. •	Douglass A. Blackmon, Slavery By Another Name: The Re-Enslavement of Black Americans from the Civil War to World War II, New York, Doubleday, 2008. •	Cécile Brunet-Ludet, Le droit d’expression collective des personnes détenues, Paris, Direction de l’administration pénitentiaire, 2010, Online. •	Joël Charbit, “Une institutionnalisation contestée : la participation des personnes détenues à la gestion de la prison”, Déviance et Société, vol. 42, n°1, 2018, p. 207-236. •	Eric Cummins, The Rise and Fall of California’s Radical Prison Movement, Stanford, Stanford University Press, 1994. •	Angela Y. Davis, Are prisons obsolete?, New York, Seven Stories Press, 2003. •	Eric M. Fink, “Union Organizing & Collective Bargaining for Incarcerated Workers”, Idaho Law Review, 52, 2016, p. 953-973. •	Michael Fitzgerald, Prisoners in Revolt, London, Penguin, 1977. •	Ruth Wilson Gilmore, Golden Gulag: Prisons, Surplus, Crisis, and Opposition in Globalizing California, Los Angeles, University of California Press, 2007. •	Fabrice Guilbaud, “Contester et subir : formes et fondements de la critique sociale des travailleurs détenus”, Sociétés contemporaines, 87, 3, 2012, p. 99-121. •	Renee Goldsmith Kasinsky, “A critique on sharing power in the total institution”, The Prison Journal, vol. 57, n°2, 1977, p. 56-62. •	James Kilgore, “Mass Incarceration & Working Class Interests: Which Side Are the Unions On?”, Labor Studies Journal, 37, 2012, p. 356-363. •	Ronald Huff, “The Development and Diffusion of Prisoners’ Movements”, The Prison Journal: An International Forum on Incarceration and Alternative Sanctions, vol. 55, n° 2, 1975, p. 4-20. •	Incite! Women of Color Against Violence, The Revolution will Not be Funded: Beyond the Non-Profit Industrial Complex, Cambridge, South End Press, 2007. •	John Irwin, Prisons in turmoil, Boston, Little, Brown and Company, 1980. •	Thomas Mathiesen, The Politics of Abolition Revisited, London, Routledge, 2015. •	Lilian Mathieu, “Une mobilisation improbable: l’occupation de l’église Saint-Nizier par les prostituées lyonnaises”, Revue française de sociologie, 40, n°3, 1999, p. 475-499. •	Christophe Soulié, Liberté sur paroles. Contribution à l’histoire du Comité d’Action des Prisonniers, Bordeaux, éd. Analis, 1995. •	Donald F. Tibbs, From black power to prison power. The making of Jones V. North Carolina Prisoners’ Labor Union, New York, Palgrave Macmillan, 2012. •	Heather Ann Thompson, Blood in the Water. The Attica Prison Uprising of 1971 and its Legacy, New York, Pantheon Books, 2016. On prisoners’ unions in Scandinavia, see Mathiesen, 2015, 77, 214. As an example, see the respective publications of Roger Lancaster and Dan Berger, Mariame Kaba and David Stein.